If your corporation is seeking a qualified Meditation teacher to provide corporate meditation classes, what criteria should you use to evaluate applicants? Do you start by looking for people that are “Certified Meditation Teachers”? Stating that someone is “certified” would lead most to believe that this person is qualified to do whatever they were trained to do. However, when it comes to someone stating that they are a “certified meditation teacher”, I would recommend that you understand exactly what this means before hiring them. 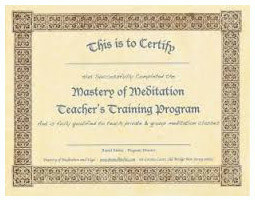 What Is a Certified Meditation Teacher? Let’s start by understanding that currently, there is no recognized governing board overseeing Meditation certification and qualification. Because of this, there are many organizations that are offering Meditation training programs with certifications being granted, upon the completion of the courses, and there are no organizations to evaluate the validity of these certifications.. This makes the title of Certified Meditation Teacher questionable. Stating that someone is a Certified Meditation Teacher or a Certified Meditation Instructor does not necessarily mean that someone is qualified to teach meditation classes. It simply means that the person has taken some type of class relating to what an organization calls “Meditation” and the person has passed whatever criteria is used to evaluate whether they pass/fail a class. For more than 2,000 years, there was only one way to learn Meditation. That was to go to a monastery and study to become a monk. This training typically started for children, or young men, lasted several years, and was a very long and demanding experience with students studying ancient texts and meditating for several hours each day. What Criteria Should You Use to Evaluate A Meditation Teacher? Find out where the person has taught Meditation and find out how long they have taught. Find out how they have been trained to teach Meditation. Research the person and organization that has trained the person. Ask them to conduct a Meditation class in your presence. At the Compassion Center. our lead Meditation teacher is Venerable Thupten Phuntsok. Puntsok, as he likes to be called, has been an ordained Tibetan Buddhist Monk who has taught Meditation to people around the world for the last 20 years. His lead student, and director of The Compassion Center, Dan Globus, has studied Meditation with Puntsok for the last 8 years and worked with Puntsok to create a style of Meditation that is rooted in Tibetan Buddhism. Dan teaches a guided Meditation technique that is extremely simple, easy to learn, and is completely non-religious. It is based upon Vipassana Meditation, Mindfulness, Mantra recitation, breathing techniques, body relaxation techniques, and guided imagery. It is very effective in helping people who are afflicted with high levels of anxiety, stress, depression, anger, lack of drive, and have lost joy and happiness in their lives. It is a very effective tool for substance abuse recovery. This Meditation technique is also a very effective business tool that assists executives and employees to rest, regain focus, and tap into their creative and analytical sides. Even though neither Puntsok nor Dan possess a Meditation Teacher Certification, they are expertly trained in the same techniques that have been used for more than 2,000 years to train Buddhist Monks. They are trained to heal people in a way that cannot be learned from a book. If you’re seeking a qualified teacher for your corporate Meditation classes, contact Dan Globus directly at (888) 377-7761 or fill out this form.